Hey there, everyone! Please pardon the tardiness of this post. I was down for the count yesterday...I haven't felt that sick in a really LONG time. I was nauseated, felt sick to my stomach all day...but probably the worst part was the never ending headache. No amount of Advil would get rid of it, and my head just hurt all day long. So- I slept most of the day, because I couldn't even imagine looking at a computer screen...let alone typing. So- I am a day late with my group post, but hopefully you will still enjoy seeing it! So, what did you think of this month's release from WPlus9? I just LOVE all the amazing stamp sets & dies that Dawn created this time around...but that is always how I feel with each release, so maybe that isn't say much. Ha! I went all happy and fun in my color combo for this card! Here is what I created! 2. Cut doily paper slightly smaller and adhere. 3. Cut a doily in half, glitter both sides and adhere. 4. Add a strip of chevron paper across the top of the glittered doilies, and then add a strip of ribbon. 5. Cut a banner edge to a white cardstock strip, then stamp the sentiment & hearts to it. 6. Adhere the banner strip to the card, accent with jewels and add a piece of washi tape to the top. 7. Diecut the hearts from patterned paper & cardstock. 8. Stamp & glitter the middle sized heart, then adhere all of them to the left of the sentiment banner. 9. Stamp the banners to white cardstock, then cut out. 10. Adhere to the left side of the chevron paper, then wrap twine around the seam. Top with a twine bow. Don't forget to check out what the rest of the WPlus9 crew created....it is sure to be a treat!! This card is amazing, I love it!Thanks for playing with us over at Loves Rubberstamps!!! I think it's absolutely scrumptious, Lea! You rock pink, girl, and all the shimmer and shine is delish! So glad you're feeling a little better! Those headaches get me down for the count, too. Try Aleve. What a darling card, Lea! I love the washi tape, the doiies and the little tags tied with baker's twine. Darling! Thank you SO MUCH for sharing with us at Word Art Wednesday. It's a pleasure to have you join us, and I appreciate it more than you could know. I hope you come back soon! This is really pretty! The colors are awesome and I really love the layout and the doily accents. Glad your feeling better! I was sick 3 days this last week with a nasty bug myself! Lots of stuff going aroud! Thank you so much for playing along with us at Loves Rubberstamps this week! 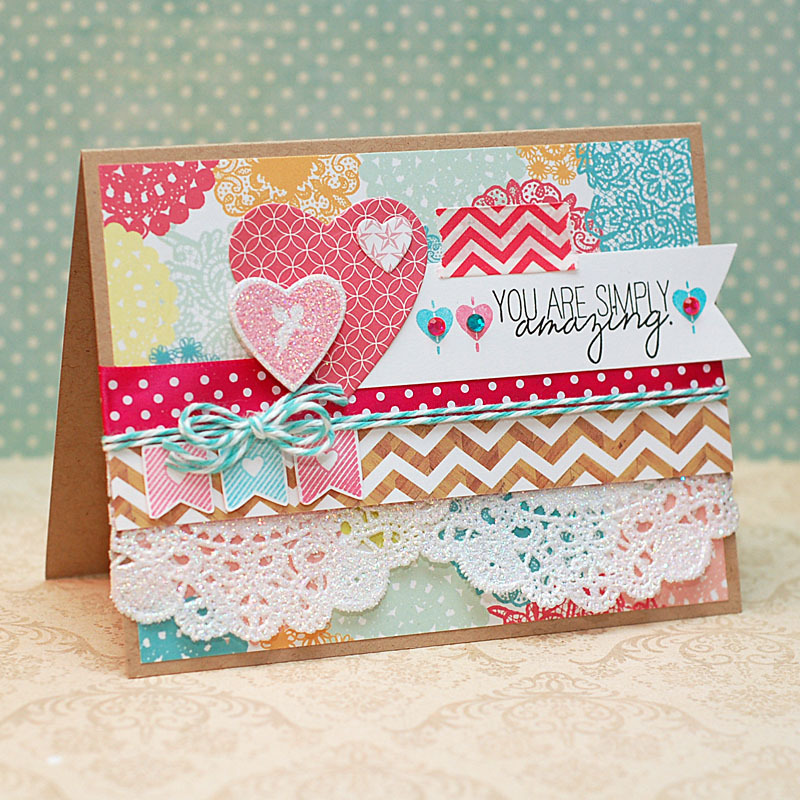 What a really fabulous card, love the colors and all the details on your card! Thanks for joining us at Loves Rubberstamps! This is so cute! Love the glittered doilies! Hope you are feeling better. The sentiment on the card are just the right words what I want to say about this card. Love it. Love the bright colors. And the sparkly doilies on the bottom. Just WOW. Thanks so much for sharing your art with us on WAW. The way you described your card is how I would too: happy and fun. :) I am so sorry you've been feeling lousy. I too have had those sicknesses where headaches just won't quit. Feel better soon! Doily love. Cute papers and card. Thanks for sharing at LRS! beautiful! question...how do you make your photographs appear so large on your blog? You mix patterns SO well! I love this! I love all the texture and the mix of patterns. So Great! Wow...this card is just awesome. Love all the colors!! !